Gibraltar Point is a dynamic stretch of wild coastline running southwards from the edge of Skegness to the mouth of The Wash. 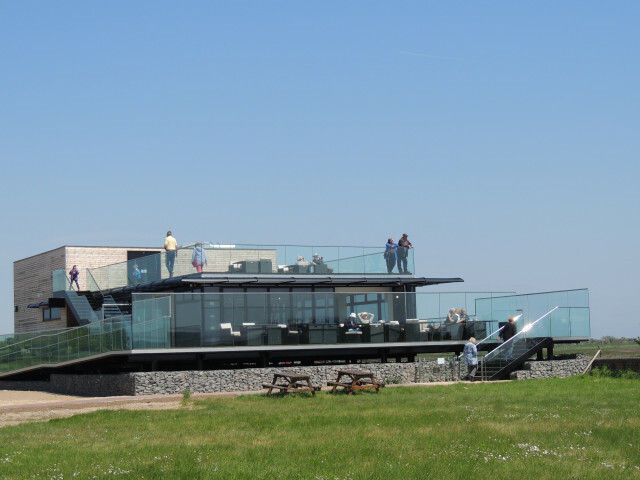 Designed to make the most of the reserve’s stunning views with expansive windows and a rooftop viewing deck, the new visitor centre is the perfect place to start and finish a visit to Lincolnshire’s wild coastline. The cafe serves tasty, homemade, locally sourced food that can be enjoyed overlooking the unique landscape of the nature reserve. Covering over 1,000 acres of pristine coastline, Gibraltar Point is recognised as an area of international importance for wildlife. In spring, the first of the migrating birds stop off to refuel or establish their territories. In summer, skylarks and meadow pipits are in full song on the saltmarshes and the sea lavender blooms. In autumn, huge whirling flocks of waders can be seen at close range during the monthly high tides. In winter, brent geese, shorelark and snow bunting give Gibraltar Point its special character, supplemented by thrushes, finches and the occasional hen harrier. Free entry to the reserve and visitor centre, small charge for parking (all fees go towards managing the reserve). Managed by the Lincolnshire Wildlife Trust. Gibraltar Road, Skegness, Lincolnshire, PE24 4SU.